In 2016 Rock Community Church celebrated its 25thanniversary. Started as a church with a heart for the community, it was a moment to reflect on the journey so far but also to dream afresh for what the future might hold. As we prayed, reflected and dreamt, we were pulled towards the idea of focussing our energies on the communities of Dumbarton West. Statistically these communities are some of the most deprived in Scotland. They are often characterised by poverty, violence, substance misuse and unemployment. However for those in the church who lived there, another story was also being told. These are people with huge creativity, warmth of friendship and incredible talents. Rock Community Church decided to take on a former local authority community centre. 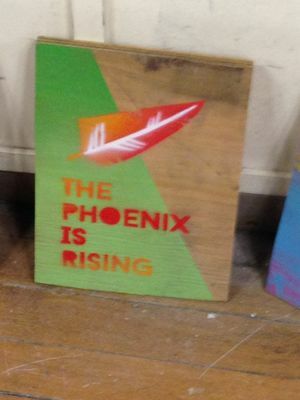 The Phoenix was historically at the heart of the community but like many other community resources had closed its doors. As the Rock spoke with local people there was a clear desire to see the centre reopened and housing youthwork, community café, toddler groups, fitness classes, etc. 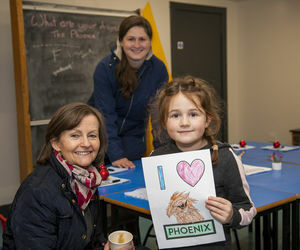 After feasibility studies, many funding applications, plenty of elbow grease, and a little help from friends and family, The Phoenix rose from the ashes and welcomed the community home again in November 2018. As part of the process of dreaming about what The Phoenix could and should be, we reflected theologically on what we were doing. The ancient Hebrew idea of Shalom became an idea we gathered around. This timeworn concept of complete peace and holistic wholeness has been at the forefront. What if The Phoenix was a place where wholeness in it’s many guises could be found, fostered, and celebrated? Our heart was to see relational, emotional, spiritual, familial, physical, mental wholeness flow out of the groups, activities, and events happening in The Phoenix. “The Art of Shalom” is part of this. It is an experiment in using the arts as a vehicle to see shalom flourishing. 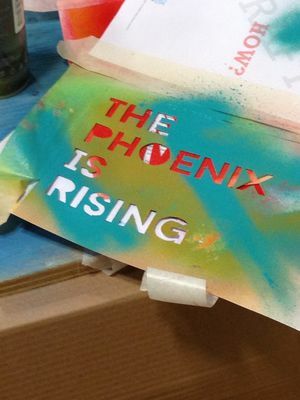 The project is multifaceted and flows in and out of various aspects of the life of The Phoenix. It will include Rock Salt Collective a group meeting fortnightly made up of artists and creatives looking at how the arts and faith intertwine. We’ll also be providing an exhibition space within our community café, celebrating the incredible talents of local artists. It will also incorporate the arts throughout our youth programmes, twice weekly youth clubs, holidays programmes, etc. We’ll be bringing in affordable arts courses with professional tutors for the community to access. We’ll be running a variety of arts based activities such as creative writing groups, knit and natter groups, etc. The Phoenix is a long term vision. Our hope is that “The Art of Shalom” is a means to deepen relationships and foster wholeness in ways that are long lasting and leave a positive mark on the community for generations to come.